Grind remaining onions, jeera powder and ginger and garlic paste into fine paste. Heat oil and fry onion cubes till trasparent. Add above prepared paste and fry till oil separates onion paste. Add meat and fry for 2 mins and add salt. Now fry till water evaporates. Now add chilli powder and add water. Cook for 30 mins till meat is done. Add lemon juice and cook for 2 mins till medium consistency. Dear Zahera Shaikh, Sorry for delay in answering your query. You can add 4tsp according to your choice but nothing less than 4tsp as lemon neutralizes the chilly powder. 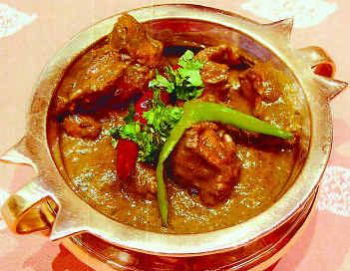 will it be tasty if we put lesser amount of chilly because 5 tsp of chilly in 1/2 kg of mutton is too much. Really awesome and tasty too. Worth a try.